Get stuck! Better even: get stuck when in the company of friends! 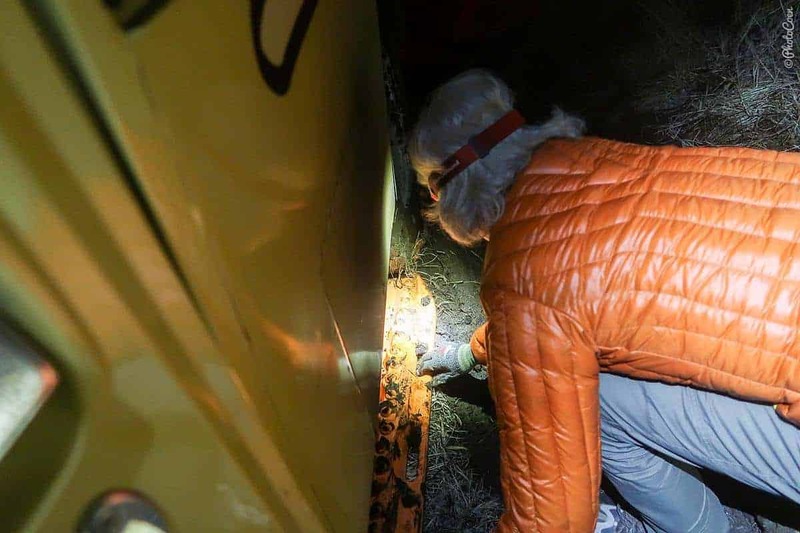 Within half an hour of leaving asphalt in Russia, the Land Cruiser skidded sideways into the gloopy, muddy side of the trail. If that was not enough, the following day the wheels churned through a quagmire without gaining any traction. The latter was embarrassingly stupid as there were dry trails leading around the mud pool on both sides. This time, however, we were in the company of friends. Maxim and Anastasia pulled us out in no time. We like guidebooks. However, I am aware that these travel writers miss out on a lot of things. First of all, no guidebook can ever cover everything and, secondly, the content depends on what the travel writers like as well as what the majority of the readers wants to know for their journey. 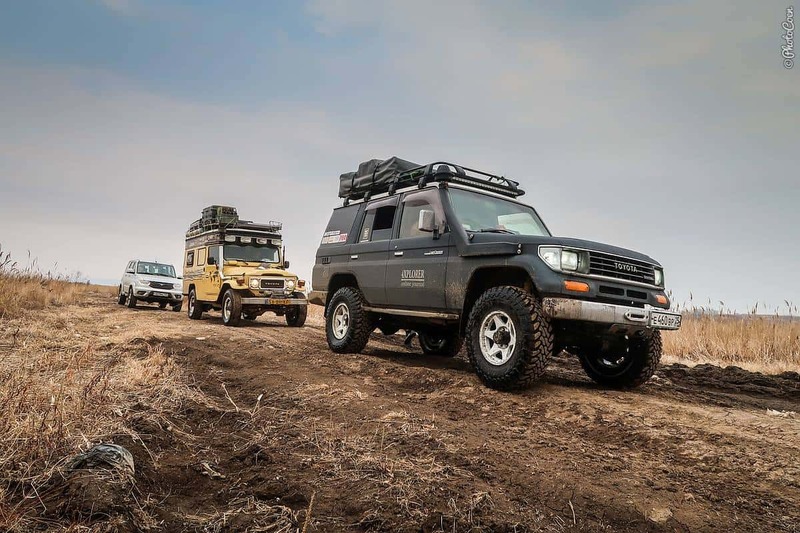 While overlanding is growing fast, it is still a niche in the travel business. You could also argue that this was an apt ending to a perfect off-roading weekend in the company of new friends from Vladivostok. 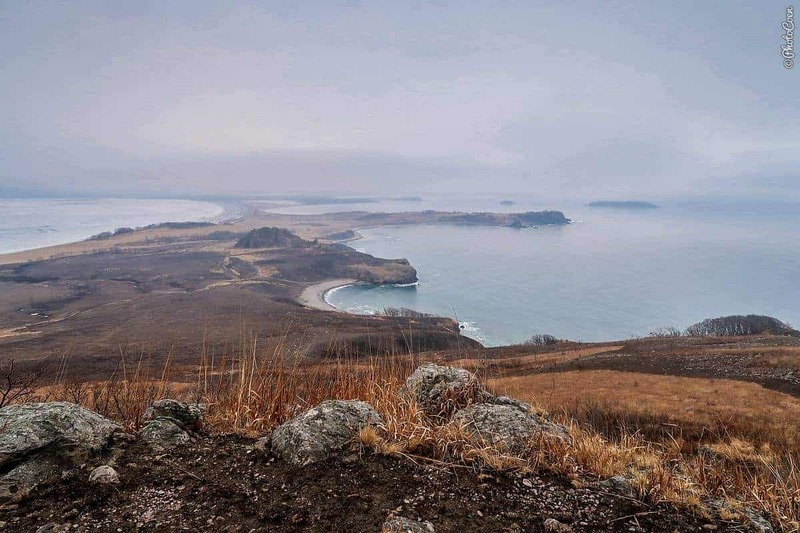 All the more we appreciated finding a local guidebook (available in English as well) about Primorye (the province of Primorsky Krai). 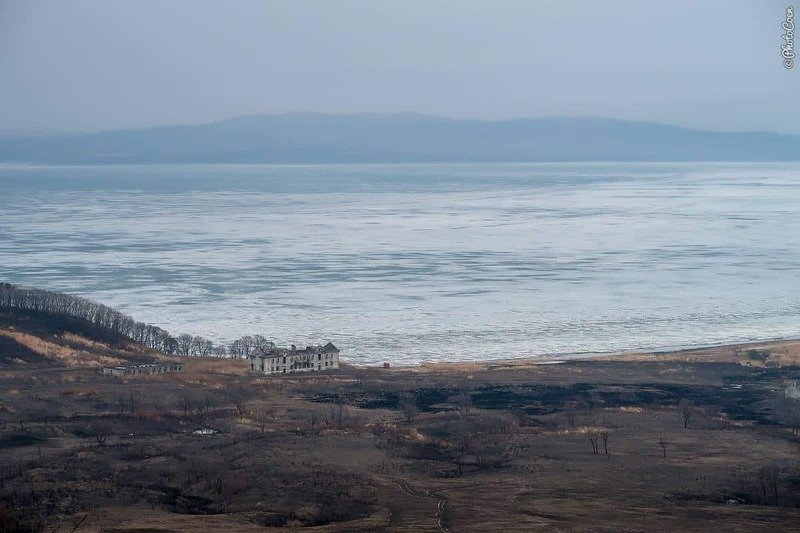 This is Russia’s southernmost province of which Vladivostok is the capital, and is locally referred to as the Gateway to the Asian Pacific. The guidebook highlights (among other things) many beautiful sites in the wilderness. 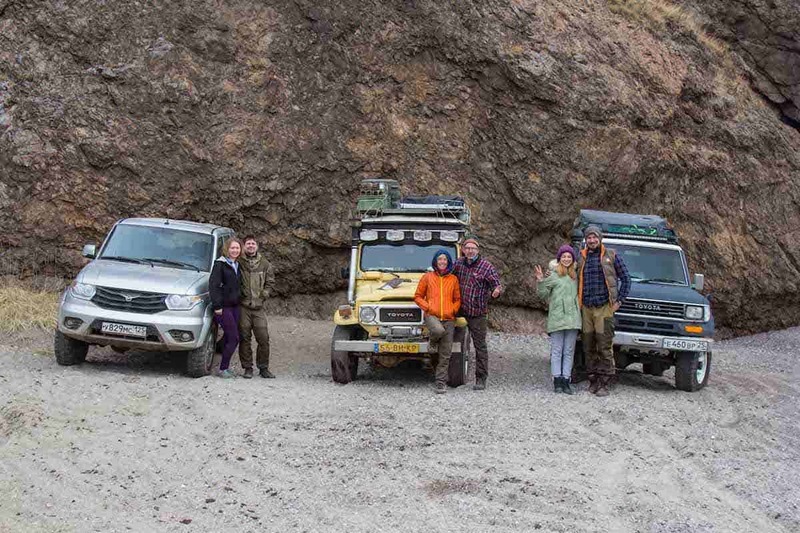 But, even better, off-road aficionados found our Instagram and Facebook pages and wanted to meet us. Saturday morning Maxim, Anastasia, Alexey, and Irinka caught up with us, finding us camped on a cliff enveloped by a thick mist that blocked any view of the spectacular bay below us. After having spent five days in the classroom learning Russian with the sun was out in full force, the mist and drizzle decided to dominate for the coming week. To return to the main road, we had to ascend the trail we had descended the night before. Here deep ruts with splashed-around mud now served as a memory to where we had struggled for an hour with the MaxTrax to get out. Our heavy truck drove in the middle so if stuck again, we’d have options on both sides to be pulled out. But, more alert this time, Coen gunned it where necessary and we jumped up the hill over rocks, fishtailed through the muddy section and returned to a bumpy rocky section once more. We were out. 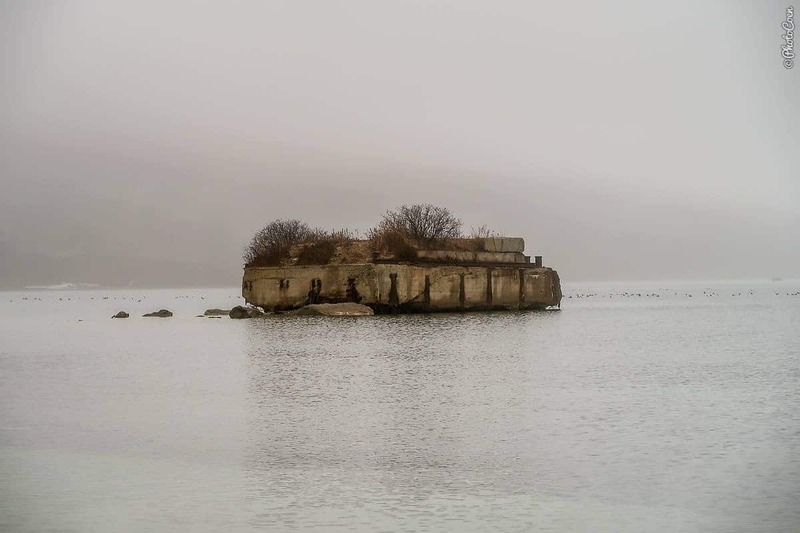 A good place for history buffs, as the coast has a fair share of ruins and monuments dating from the days of colonization up to the Sovjet Days. 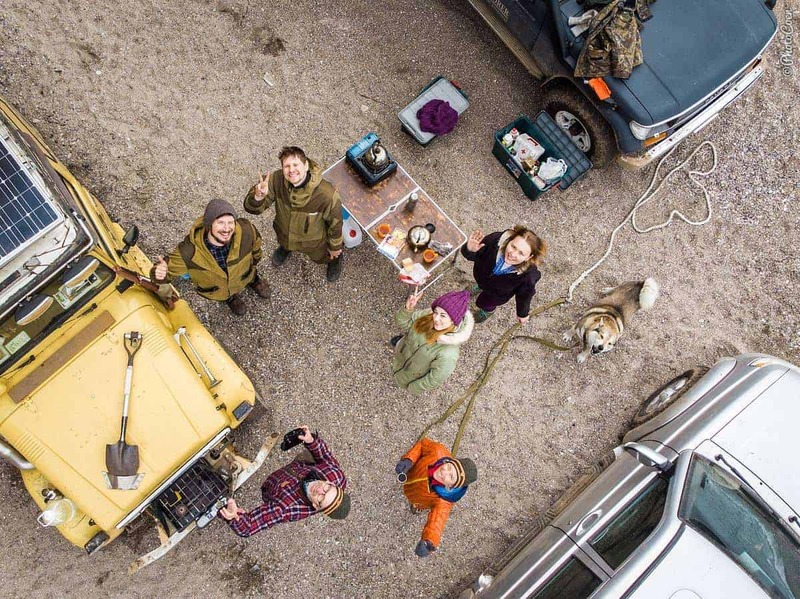 The six of us – or eight, counting two dogs – meandered farther south along the coast which, contrary to the majority of Russia’s Far East, is mountainous. The forests were still without any signs of spring. Gray trunks and branches rose from beds of chestnut colored leaves. 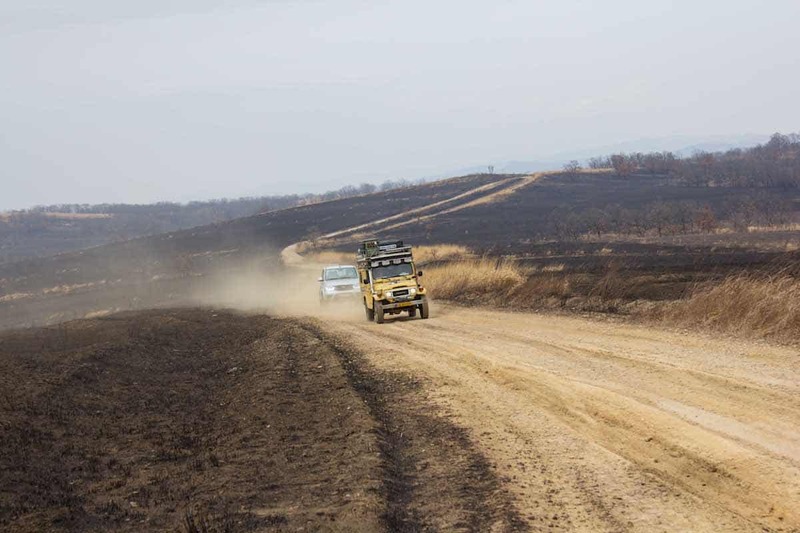 I was looking forward to building a bonfire that evening, however, once we turned onto the peninsula, the forest made way for fields, yellow or bare and black from fires. Here we took in vast views of bays and emptiness. Dreary as the weather was, in a way it added to the scenery. 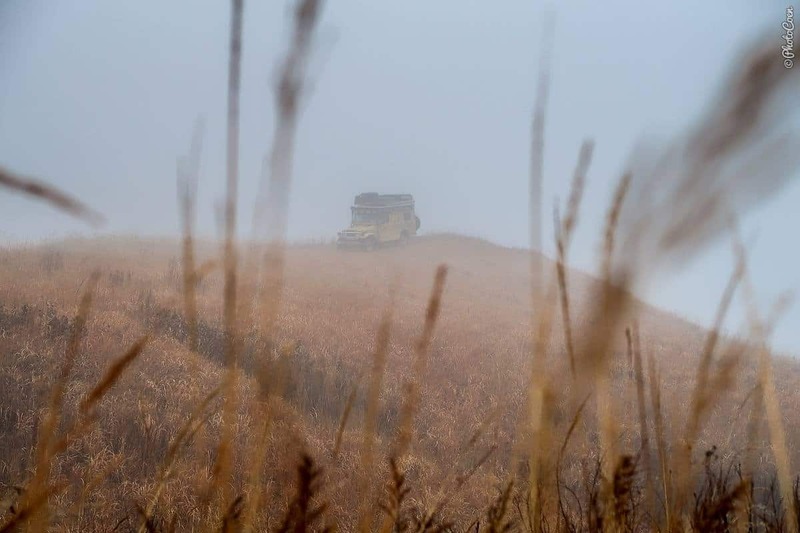 It gave a stronger sense of adventure, of getting far away from it all, to be all by ourselves in this forgotten landscape (which it isn’t; in summer it is a popular vacation spot). The path deteriorated, becoming more rutted and bumpier. Some of the paths were closed off and Alexey and Maxim searched for new ones. Parts of the coast, waterways and flooded trails were partly frozen and covered in snow. We battled it all, having a great time. More bays, more shallow and super transparent waters. The last migratory ducks flying overhead, hopefully escaping the deadly shot from hunters who sat in camouflage outfits waiting for them (the hunting season would last a few more days). At the end of the afternoon, we arrived at the Sleeping Dragon bay. New toy: the drone. Stay tuned for more! Now there was nobody so we could take our pick: left or right. On the left the cliff would protect us best against the wind, so that was an easy choice. We set up camp, put on all the clothes we had, and prepared our food. To celebrate our first off-road adventure in Russia we shared a bottle of champagne and Maxim opened a bottle of wine and vodka for dinner. What else do you need? A beautiful spot along a secluded bay, inspiring company, a warm meal and a bit of booze. Life couldn’t be better as it was right there, right then. What a privilege to be here. 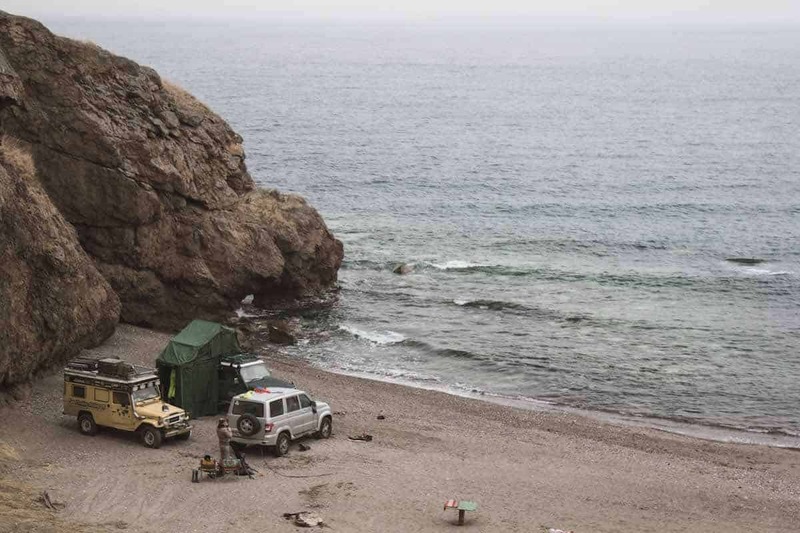 Meanwhile we have been in and around Vladivostok for almost 3 weeks. And we could spend weeks more in this province alone. 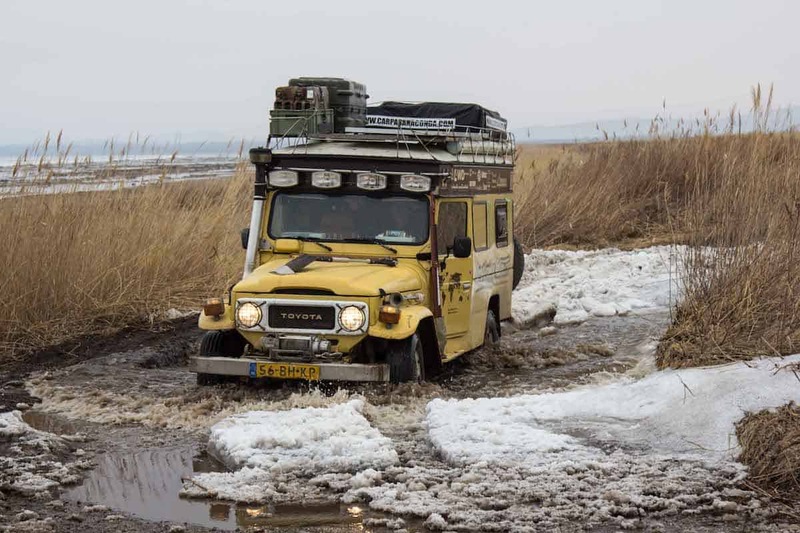 Seriously, reserve some time on your overland journey to explore this part of Russia! With only a one-year visa (during which Russia allows us to travel only 90 days per 180 days), you may understand that we are already having visa stress without having properly gotten started yet! 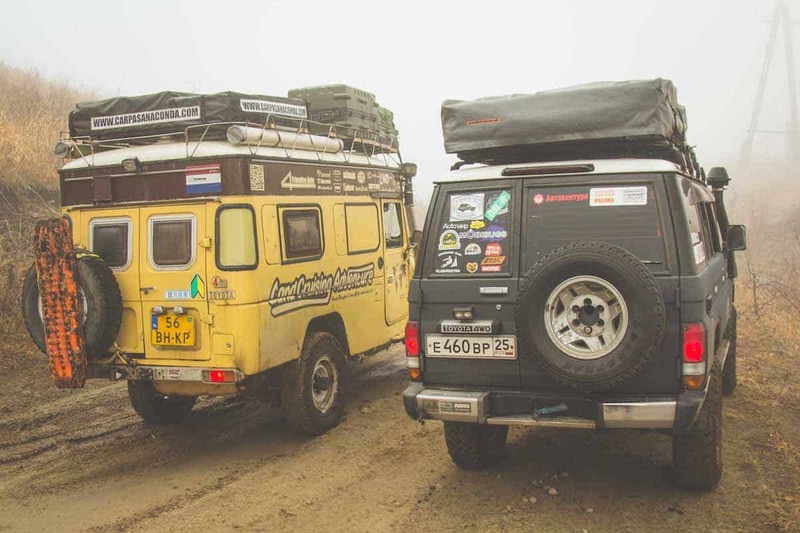 How do overlanders do it, traveling in Russia? 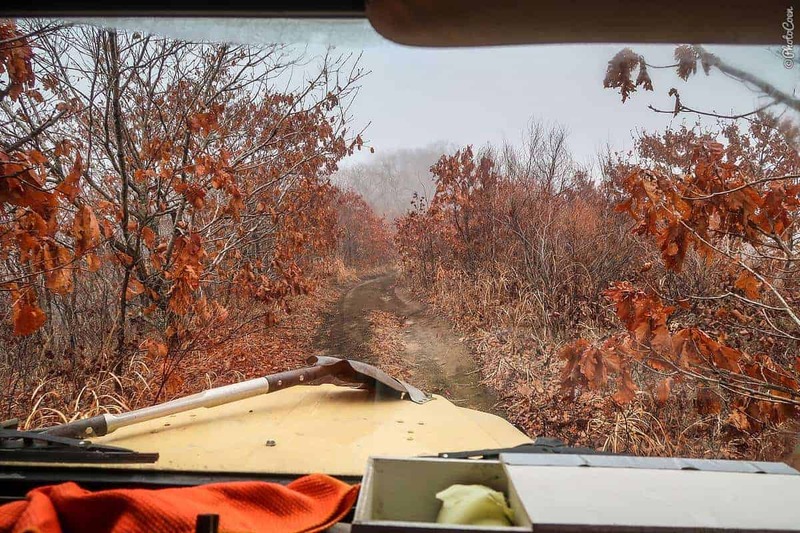 Doing the country justice, exploring the most remote corners, meeting people, and seeing it all? I mean, we spent one year in Korea alone! This is going to be a continuous battle on where to spend our time. 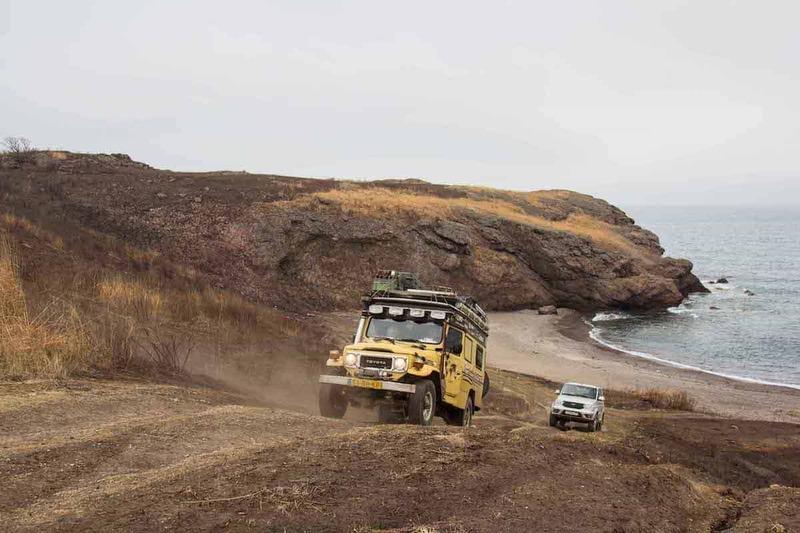 Tomorrow we will start another loop through Primorye, this time towards the east, and then north to Khabarovsk. Stay tuned for more! Thank you all for your invitations through our website and social media. We love it and do our best to honor them all as we are just as eager to meet you all! But, please understand it may not be possible to meet everybody. 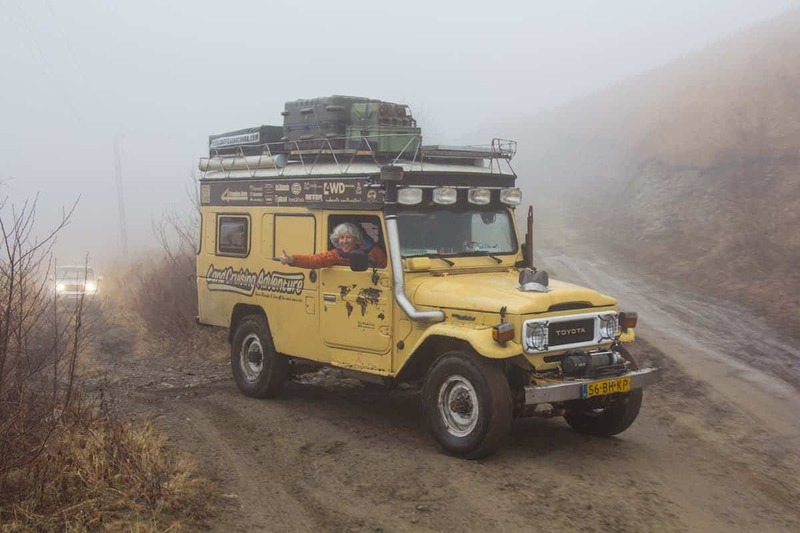 In Vladivostok, thank you Yuri and Svetlana for getting our Land Cruiser out of customs so quickly and easily. Thanks Tania for teaching us some of the basics of your language. Thank you Tatiana and Roman for hosting us. Thank you Vlad and Julia for offering us a shower in your house (one of the best things you can offer to travelers!). Thanks Alexey, Irinka, Maxim and Anastasia for the wonderful weekend. A big thanks to Roma, for some Land Cruiser TLC. And thank you all ‘Vladivokstonians’ for dropping by for a chat, taking a picture, offering us a coke or coffee. We have loved sharing time with you. 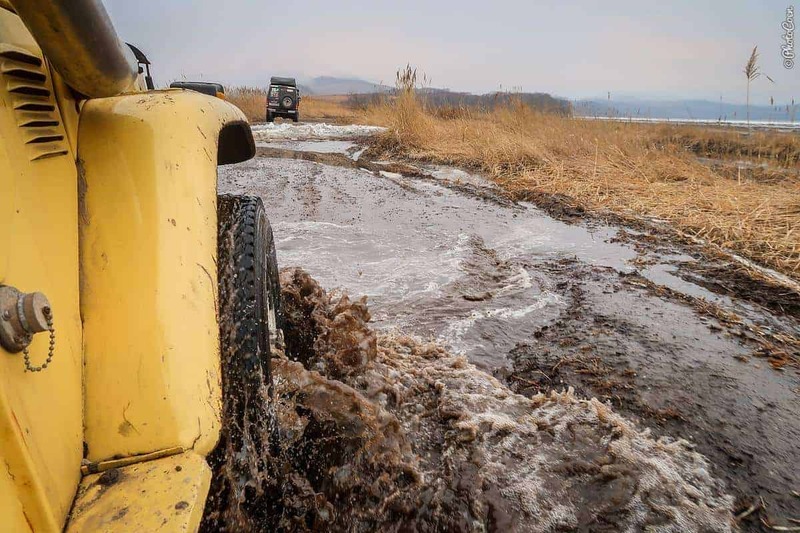 Some of the photos about our off-road adventure in Russia were taken by Alexey. Check out his other pics here. 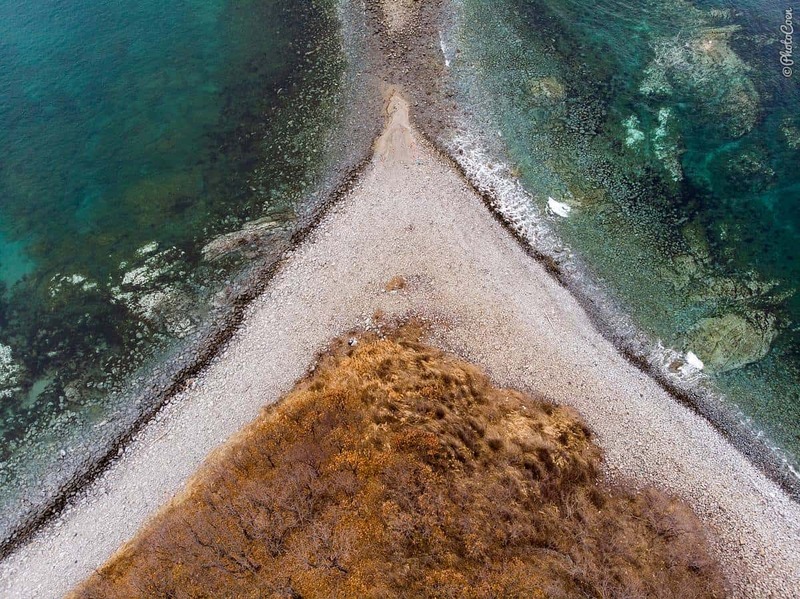 To kick off our journey in North Asia, we put together this short drone movie. Thank you for your wonderful travel story. My wife and I drove across Russia into Finland and up to Norway before turning south to rest of Europe. We are Chinese and we started our trip from Manchuria the border town. You’re welcome. We hopefully get our visa for China this afternoon. The plan is to go to Beijing and the far northeast in Aug/Sep (without the vehicle)!